Every week we pull together some great Canadian recipes from Canadian food bloggers around the web featuring one main ingredient or dish. This week we take a favourite snacking treat to a whole new level with pistachio recipes! Pistachios are a favourite snack for many but they also add a delicious, distinct flavour to many dishes. Crushed, they make a great crust for fish or chicken. Blend them up for pudding or an alternative take on pest. They're a great add in to a salad and are popular in ice creams, gelato and more! Here are 22 ways to use pistachios in your cooking! 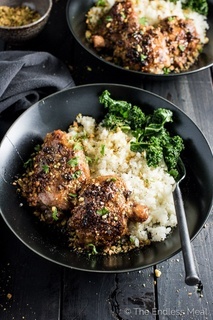 What a flavour combo in this **[Sweet and Sticky Pistachio Honey Chicken](http://www.theendlessmeal.com/sweet-sticky-pistachio-honey-chicken/)** - and easy to make healthy dinner option. From **The Endless Meal**. These delightful **[Pistachio Cranberry Cream Sandwich Cookies](http://www.lovemefeedme.net/pistachio-and-cranberry-cream-sandwich-cookies/)** are a great treat for anyone but... they're also vegan! From **Love Me Feed Me**. Treat yourself with this indulgent **[Pomegranate Pistachio Granola](https://urbancottagelife.com/2016/12/19/indulgent-festive-crunch-❦-pomegranate-pistachio-granola/)** for breakfast. From **Urban Cottage Life**. These little frozen **[Pistachio Pesto Bombs](http://woodcuttersplate.com/pistachiopestobombs/)** are Whole 30 approved and provide a great added burst of flavour to your cooking in a pinch! From **Woodcutter's Plate**. **[Pistachio Gelato](http://foodnouveau.com/recipes/desserts/frozen/pistachio-gelato/)** doesn't just have to be a summer treat! From **Food Nouveau**. Pistachio makes a great crust for seafood like this **[Pistachio Crusted Salmon](https://www.sweetandsavourypursuits.com/pistachio-crusted-salmon/)**. From **Sweet & Savoury Pursuits**. **[Pistachio, Cocoa and Cherry Granola Bars](http://www.earthfoodandfire.com/pistachio-granola-bars/)** are a great snack to have on hand when they munchies hit! From **Earth Food and Fire**. This dish of **[Quinoa and Blueberry Salad with Pistachios](http://infinebalance.com/quinoa-and-blueberry-salad-with-pistachios/)** just screams summer dreaming to us! From **In Fine Balance**. Meringues are a perfect delicate spring dessert. We love these **[Pistachio and Rosewater Meringues](https://www.thefinercookie.com/recipe/pistachios-and-rose-water-meringues/)**. From **The Finer Cookie**. What a great twist on pesto: **[Pistachio and Radish Green Pesto](http://www.diversivore.com/recipe/roasted-radishes-with-pistachio-radish-green-pesto/)** served with Roasted Radishes. From **Diversivore**. A big thank you to all our FBC Members who participated in this weekend's pistachio recipe roundup.